It's been weeks since the movie "Suicide Squad" has hit the movie theaters and a lot of moviegoers out there still can't get over the disaster that went wrong in the recent DC Comics movie adaptation. "Suicide Squad" might not satisfy the taste buds of some fans, but for me, this is something new from the DC Comics Cinematic Universe. "Suicide Squad" breaks away from the dark genre of any DC Comics movie adaptation. Coming from the newest Batman series franchise and the recently concluded "Batman vs Superman" which all of them had a dark theme, "Suicide Squad", on the other hand, somehow managed to step out of the dark theme genre and focused on something light and funny yet has a strong entertainment value. Besides, who will not love the movie with Robbie Margot in her Harley Quinn performance... She's just lovely and the camera simply loves her every angle. Moreover, Will Smith is back on the big screen, which we can also give credit to the DC Comics movie production for convincing him to play Deadshot in the film. Also, Jared Leto's interpretation of Joker also gives justice to the role. These three actors, along with other co-stars are perfectly casted in the movie and that alone made the whole "Suicide Squad" movie an A-list film this season. Perhaps the problem with the story of "Suicide Squad" was that it was somehow not loyal to the story in the comics, but then again, moviegoers and fans should think that DC Comics is trying to make a DC Cinematic Universe for their comics characters that Marvel has started some 10 years ago. We must give credit to these producers for pushing cinematic universe we all want to see. Afterall, the main goal of these production outfits is to make our childhood superheroes, supervillains, and anti-heroes a reality that we all wanted. Overall, DC Comics' "Suicide Squad" is an explosive and insanely awesome film from beginning to end. A 10 out of 10 stars for the entertainment that we received from watching the film, the use of favorite pop songs in the entire movie, and for of course, for Robbie Margot's stunning and believable performance! Kudos! Make sure to stay until the mid-end credits to reveal a spoiler for the upcoming "Justice League" movie. 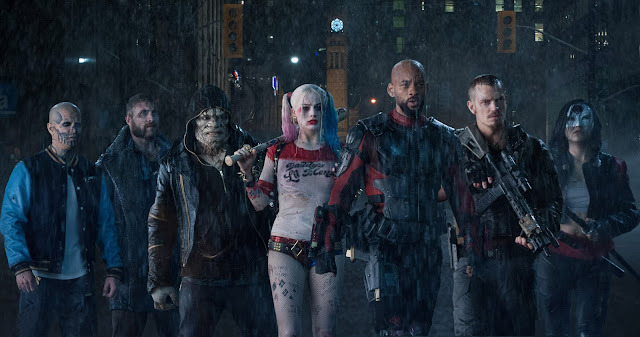 Watch "Suicide Squad" movie trailer below. Enjoy!